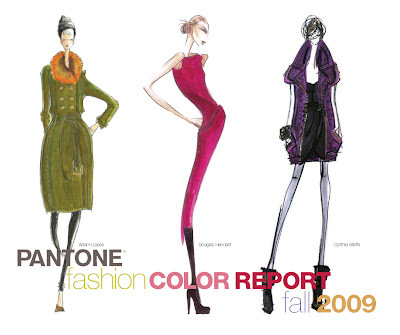 For Fall 2009, the colors will be very simple, muted, and a bit on the understated side- a BIG difference from the rich jeweled tones of seasons past. What does this mean? According to the Budget Fashionista classic colors like cream, gray, soft red, and black will dominate, which is a good thing because these are classic colors which will have a place in your closet for years to come. 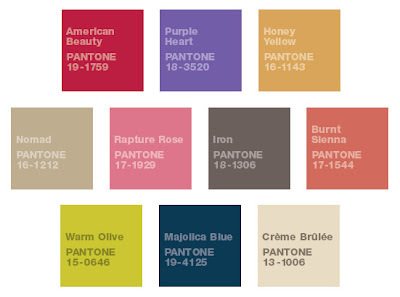 *Head out to the end of the winter season sales and stock up on black wool, red, brownish- orange (aka sienna), and muted purple. - If you’re sick of black (and let’s face it can get old), navy or midnight blue is a great alternative. Wear it the same way as you would wear black (as a neutral base). *It might not be a good idea to wear a color like Warm Olive head to toe, instead use it as an accent piece- it would make a great hat, scarf, etc. What do you all think of the colors to come? Are you in? Leave a comment and tell us what you think! 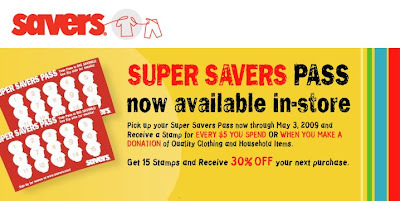 This weekend is the last weekend for BOGO over at Payless (sale officially ends Monday, March 2). Visit the sale here. I wrote a post about some of my favorite styles here. We are getting a new Forever 21 in the valley! They are having their Grand Opening at South Towne Center mall in Sandy on Saturday, March 7. The first 400 people in line by 9 a.m. will get a free gift card valued between $10 and $210. Details are here. Plato's Closet (in Taylorsville) is having a Birthday. Monday, March 2, they are having rotating sales all day. Uptown Cheapskate is a new consignment store, and it's grand opening is today. I am so excited. I have been waiting for months for a consignment store this close to home. I found a deal to buy (2) $25 gift certifiates for just $25. You can get that deal by going here. That's all I have for now. If any of you know of any great deals or events going on, please leave a comment. I will be putting up another post later today, rather than an Under Twenty series. I am really excited about it the post, so please check back for it! 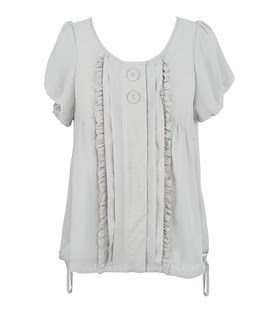 According to Reachel at Cardigan Empire, the hourglass figure is an illusive thing. Envision the likes of Sophia Loren, Marilyn Monroe, and Lynda Carter. 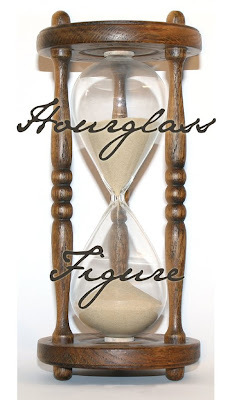 Imagine my surprise that I found out that I am an hourglass (and no, I do not look like Sophia Loren). Each body type has it's own upsides and downsides. Some of the difficult things about dressing an hourglass are the standard short waist and the scarcity of apparel that shares hourglass proportions. 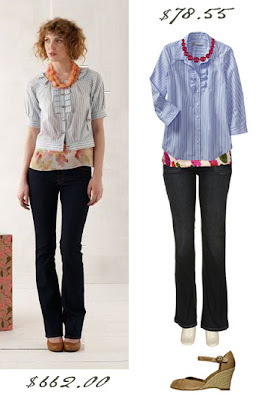 If every button on a blouse is closing without pulling, it is sure to billow around the torso (perhaps this is why I have a built-in avoidance for button-up blouses). 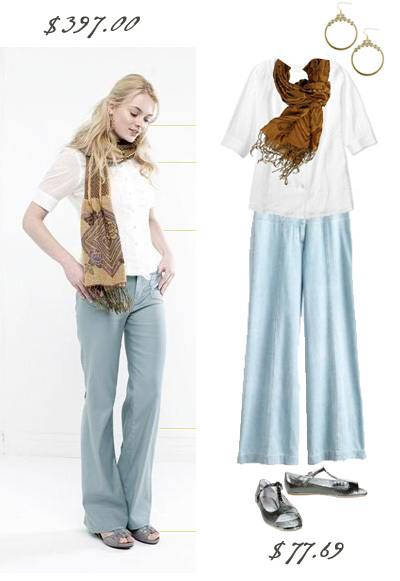 And to find trousers that comfortably fit both seat and thighs, the waist band consistently gaps. 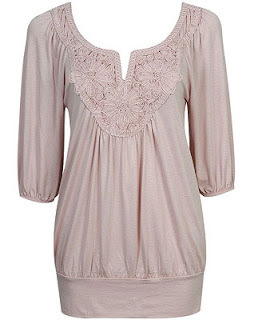 This top might be best for slimmer hour glass figured ladies. I like the cute pointelle pattern and the belted waist. This top may not have been something I would have been drawn to on its own (although I do harbor some serious love for animal prints). 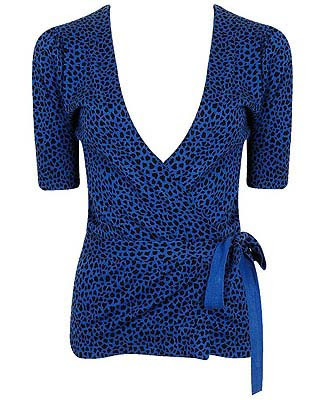 The great thing about this top is the lack of buttons, and the flattering wrap to show the smallest part of your middle. 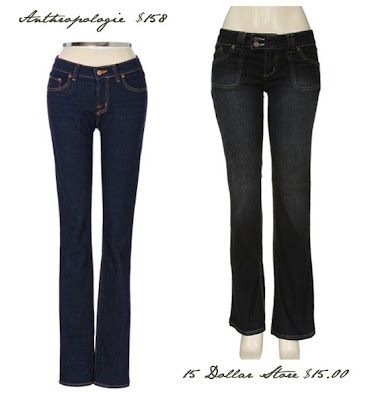 A Boot Cut jean will balance the width of the hip. Look for a curved yoke and a midrise that embraces the narrowness of the waist. Multi-Colored Tie Front Dress $29.80 from GO Jane. The pattern on this dress is not for the faint at heart, but if you can pull it off, it will show off all the best parts of your figure. Can you say, "Va Va Voom"? 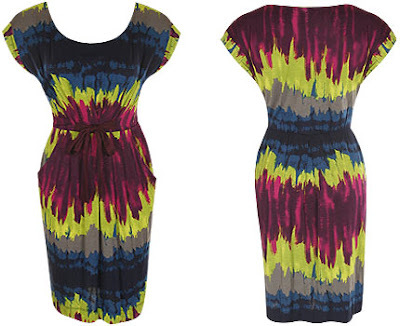 Show off those curves with this belted dress. Read Cardigan Empire's full Mythical Curves post here, for even more tips on how to dress your shape. 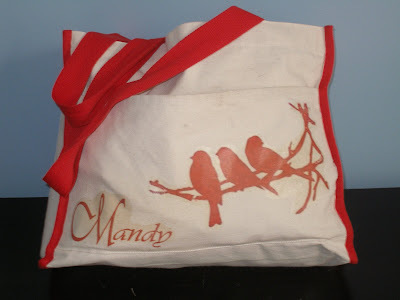 My long time friend (and former 4x100 team mate and roomie) Mandy, tackled the DIY Tote project, and sent her pictures along to share. I love the idea of using a tote bag with colored straps. Looks amazing. I am so glad that she made the bag, and that she was kind enough to share her results. If any of the rest of you get through a project posted on the blog, please send us your pictures! First, have you done your measurements? I am really excited to start posting on dressing for your body type, but you need to know what your body type is first. So, if you haven't done it, go do it! Now, on to the post. 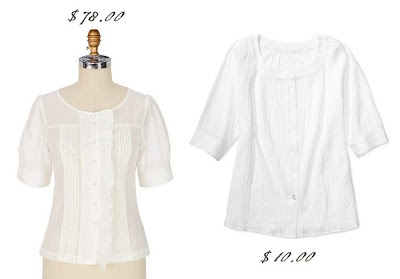 I know what you are thinking, "Why isn't this blog called I heart Old Navy?" Ok, so I love Old Navy. They have cute styles, reasonable prices, and incredible clearance racks. So, I say it loud and proud, I LOVE OLD NAVY! Anyway. The store is having yet another sale. This sale ends Thurs (2/26). So, if you want some spring items, go grab them! Shop all women's New Arrivals here. Check back tomorrow for our first Body Type post! The first step in the process is getting measurements. 1. Strip down to your undergarments. Measure while wearing all of the things you usually wear under your clothes. While measuring, keep the tape taut (not too tight, not too loose). This may require asking a friend of an intimate nature (mother, sister, or husband) to help you. 2. Measure your bust - across the fullest part of your of your bosom and straight across the back. 3. 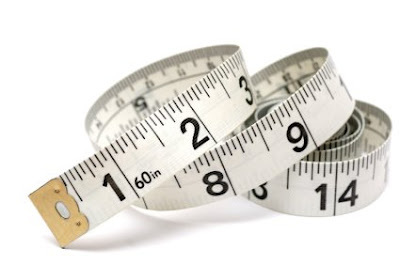 Measure your waist (the most narrow part of your body)- somewhere in the vicinity of your navel. 4. Measure your hips - navigate the tape around the fullest part of your bottom, around the curve of your hips, and straight across to the front. Put these measurements away for the next few weeks coming posts on how to best dress your body on a budget. These are the type of shoe that I would buy and not take off for a week. These would take me anywhere and everywhere. 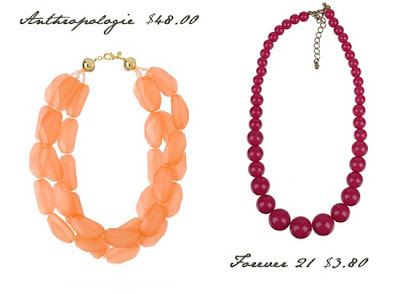 They are must haves for a fun pop of color. 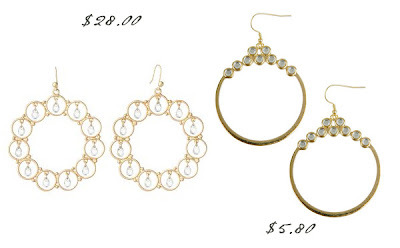 Find them at GO Jane for $10.70 (orig. $18.99), here. I have a blatant love affair with the color gray. 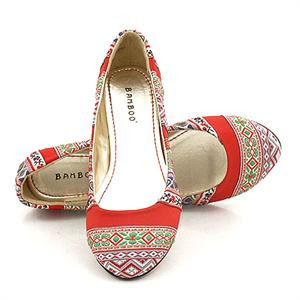 Pair it with a pattern and a flat, and I just can't say no. Find these for just $12.70 (orig. $14.80) at GO Jane, here. There is no denying it, I have a shoe fetish. And, truthfully, I think I have a patterned shoe fetish. Nothing makes me happier than looking down and seeing a cute print all over my shoes. 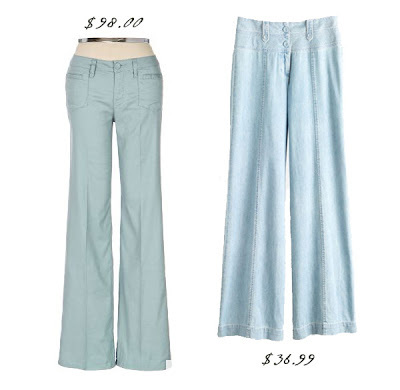 Get these for $16.50 at GO Jane, find them here. Don't forget these prices are good today only! If you have a look you want to see for less, drop me a line at uberchicforcheap (at) gmail (dot) com. Tiered Floral Tank - Charlotte Russe $9.99 (orig. $19.99). Nothing screams spring like this flirty flowy tank. I am totally in love the pattern and the tiers. 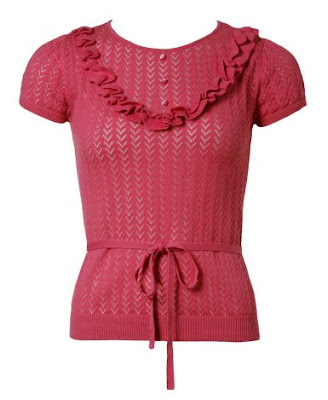 High Buttons Cardigan - Pink Ice $12.99 (orig. 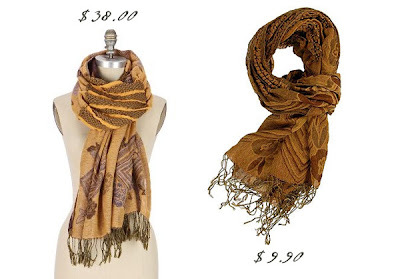 $17.99) - Also available in Black, Charcoal, and Fuscia. This Cardigan would be very versatile, and it's thin enough to wear well into spring. 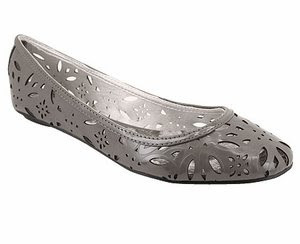 Pleated Knot Flat - Go Jane $10.99. These are available in Gun Metal (shown) and Bronze. Talk about a sweet deal! 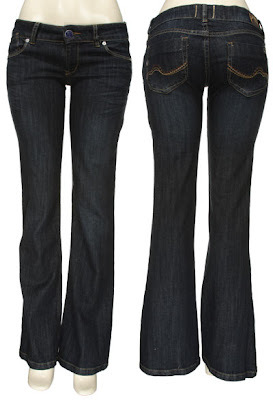 Skinny Zip Ankle Corduroy Pant - Forever 21 $13.50. Part of the Fabulous Finds, and available in Grey (shown), Black, Purple, and Navy. 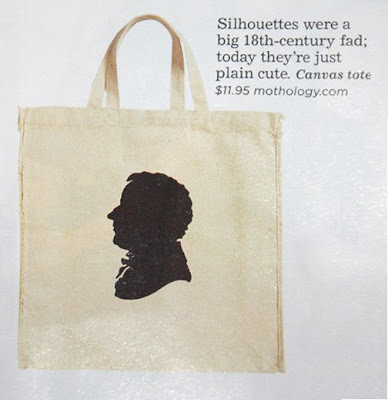 I spotted this tote in the editor's picks of March's Domino Magazine (it's rumored that this will be the last ever issue of this well loved magazine.) I have been digging the John Adam's mini series on DVD, and since it is President's Day, I thought I would share a craft, Federal Style. 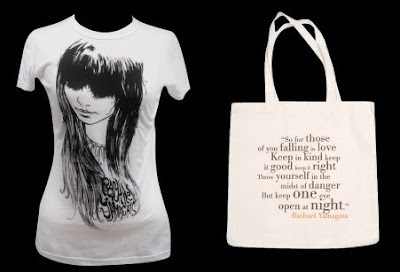 I actually went to the listed website to find the tote, because $11.95 is a pretty good price. But I couldn't find this product anywhere! I couldn't find anything similar anywhere else either. So, here' a quick DYI. You can do this craft a couple of ways. You can use the iron on method that I give directions for in this post from January (this link also lists the best places to buy totes.) Or, you can use the Freezer Paper Stencil method posted here just last week. 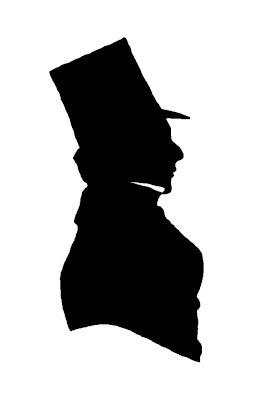 I am supplying an 18th Century Silhouette for you to use. 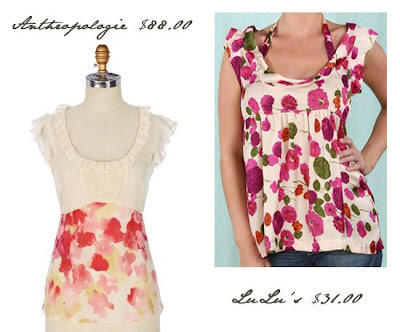 Anthropologie inspired items all day! I am completely in love with this super lightweight, sheer grey blouse. (shocker!) It has short, bubble sleeves and a shallow scoop neck. It's covered in cute details and hits slightly above the hips. Go get it and be fabulous in grey. It's 17.99 from Heavenly Couture. Find it here. This super sheer beige blouse is fabulous. 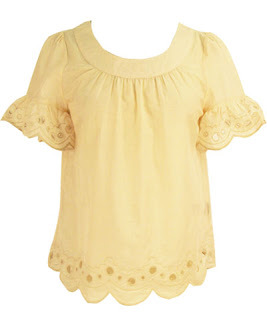 It has great details from the scalloped bell sleeves to the emboroired cut-outs. It hits at about the hips. This is one of those things that I would buy and wear EVERYWHERE, the dentist, the office, church, grocery shopping, you name it! Go get one! These heels have that funky school girl / librarian thing going on. 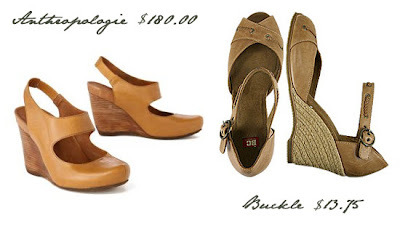 Plus, they are incredibly similar to these from Anthropologie (at a $100 savings). Super-cute draped knit top with 3/4 sleeves, a bodice trimmed with floral designs, and a banded hem. 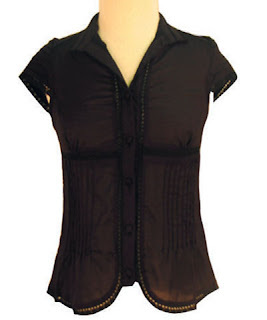 This solid black, lightweight blouse has so many great details. 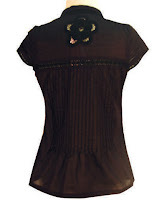 It has small pleats below the chest, back and cap sleeves There is lace detailing at the ends of the sleeves, along the upper back, around the small collar, and the front of this blouse. The back has a bold cutout lace design resembling that of a flower. It's so sweet, I just want to eat it for dessert. According to this post at YHO, Shade Clothing is having another great sale. Their Five Dollar Sale is going on at Provo High School on Monday. Every item will be priced at just five dollars, and a portion of the proceeds will be donated to Provo High School’s IB CAS Club. So you can feel good about your shopping binge, too. Monday, February 16, 9 a.m. - 4 p.m.
Over at One Cheap Chick, I read about another sale. Kid to Kid, a provider of resale children's apparel and toys, is having a fill-a-bag sale Friday (Feb. 13) through Monday, February 16th at its Ogden, Layton and Bountiful locations. Customers can stuff a bag with clearance items for $7. 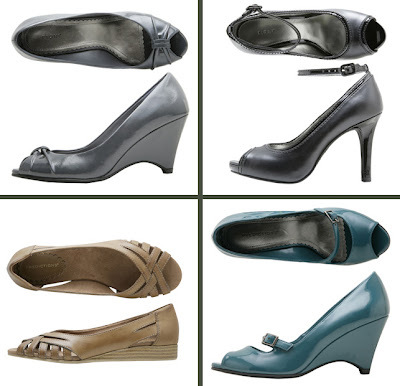 The BOGO sale is still going on over at Payless, read my post here. And American Eagle is offering free shipping thru Monday, Feb. 16. Coupon Code: 78946018. 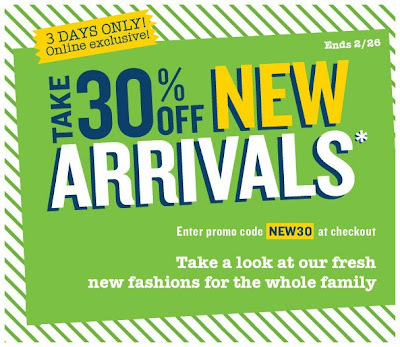 Also, all styles of denim are now $30 and under (all denim styles used to start at $49.99). So if you fancy getting yourself some distressed denim, head on over to AE. I am doing another set of Under Twenty today, so check back often for more posts! 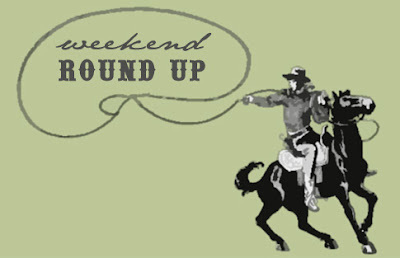 If any of you know of any great sales going on this weekend, please leave a comment. Payless Shoesource is having their semi- annual Buy One Get One 1/2 Off Everything (items of equal or lesser value) sale. The offer ends March 2nd, 2009. Also, Payless offers free in-store shipping. Grey Wedge $14.99 (orig. $22.99 - if discounted $7.49) I love this one, big surprise, it's grey. I didn't realize I was so into the wedge, I don't even own a pair of high heel wedges (yet! 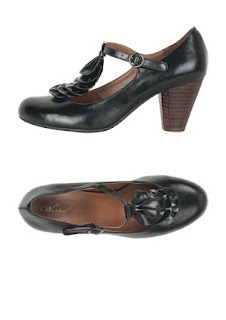 ), but payless has some great styles. I have seen blog's mentioning this craft everywhere (including say YES! to Hoboken) so I thought I would pass it along to you. According to this post from Angry Chicken, it's very simple. Trace a silhouette on freezer paper and then cut it out with an x-acto knife. Iron it on the fabric. Then, (according to Angry Chicken, this is the key), iron another piece of freezer paper on the inside of the fabric, so the grain of the fabric can't shift and the paint can't soak though the back. She used fabric paint (Jacquard) and dabbed it on. Let it dry over night, heat set it, and you are good to go. I haven't made this craft yet, but I actually have a basic shirt that I bought at the Down East Warehouse (Don't know what I am talking about? Read this post.) that would be perfect for this. 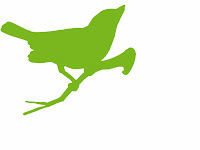 I think this bird from this DIY post from January, would be the perfect kind of image to use. If any of you have done this craft, do you have any tips? Leave a comment. Anthropologie is a store I only go in to look at. It's filled with beautiful quirky things at price tags that literally take my breath away. I find myself perusing their website from time to time to inspire my looks. I found an outfit recently that I liked, and thought I would try to recreate for less. I will disclose this by saying that this task was much more difficult than I anticipated, and even though I spent more hours than I care to count up doing it, I know it's not dead on. Hopefully, it can inspire you anyway! I think the shirt may be my favorite part of the ensemble as well as the hardest part to get right. The Old Navy version is missing many details, but with a $170 price difference, that's something I'll get over. These necklaces don't even compare, and I know it. But, I looked and looked and found nothing for less then $40, so I just decided to get something that I thought matched the colors, and was a steal, ta da! Frankly, I think these shoes without pants to cover the tops aren't that great. So, I didn't feel bad when I didn't find an exact match. 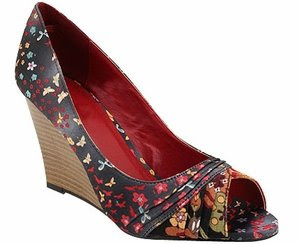 I thought these wedges from Buckle were a fun choice, a similar feel, and honestly, better looking. You can't beat that $165 price difference either! Hope you enjoyed my attempt at this look for less! If you have a look you want to see for less, drop me a line at uberchicforcheap (at) gmail (dot) com.